Main screen of the program. Code monkey. Robot. Machine. Programmers are called names like this all the time, and often for good reason. They delve so deeply into the software world that they seem to lose their human side, and similarly, their software is designed without the human user in mind. I wanted to solve this. I wanted to create a solution that would bring the human side back to coders. Throughout this hackathon, I learned much about natural language processing, machine learning, and AI--especially with TensorFlow in Python. But these sophisticated libraries proved no match for the elegant solution I am about to unveil. What better way to show programmers their human side than to show them the very thing that made them lose their human side in the first place. Their gateway to the software world. Hello, World! 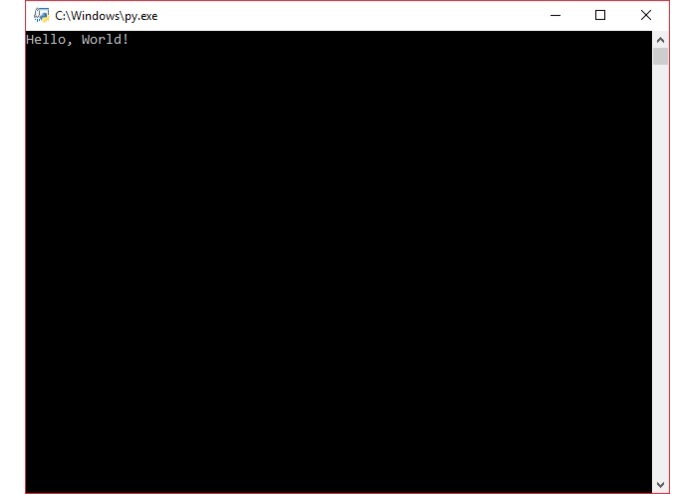 When opened, the program displays "Hello, World! ", until the user presses enter to close the program. The TensorFlow machine learning library was quite enticing for the task, though I had to put my experience in and passion for this library aside to pursue the more elegant, efficient, and effective solution. Though technically simple, the conceptualization of this solution was extremely difficult. Therefore, I am proud of being able to think of this solution. The best solutions can be the most straight-forward ones. This program represents the raw, inexperienced product a new programmer would create. The last time a programmer is truly human. This program has no future, as it perfectly allows one to reflect on the past. I conceptualized the hack and developed all the software.